Winning is everything, which is why DeNové strive to maintain excellent performance. In furtherance of this goal our Quality Assurance Surveys evaluate factors such as the standard of work, consistency of work, approach, attitude and the expertise of the staff. The Quality Assurance procedure provides our clients and prospective clients with total transparency regarding the services provided. Using the Likert Scale, each factor is rated to measure and improve upon performance. 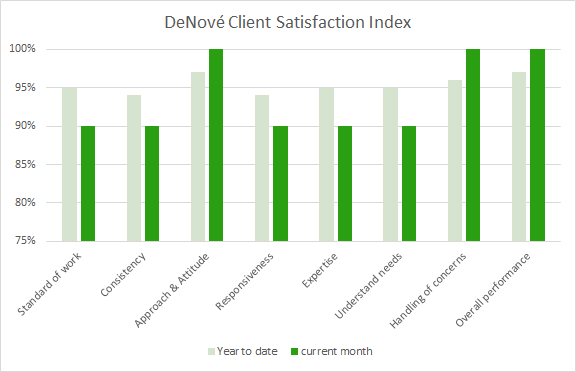 The DeNové Quality Assurance Survey ensures transparency in our customer relations. The score represents the overall performance of the company with regards to customer satisfaction and loyalty. Our Quality Assurance procedure allows us collate truly worthwhile and meaningful feedback from customers. Utilising the TQM principle, a customer centric approach is taken to ensure the DeNové Team are continually improving upon performance. 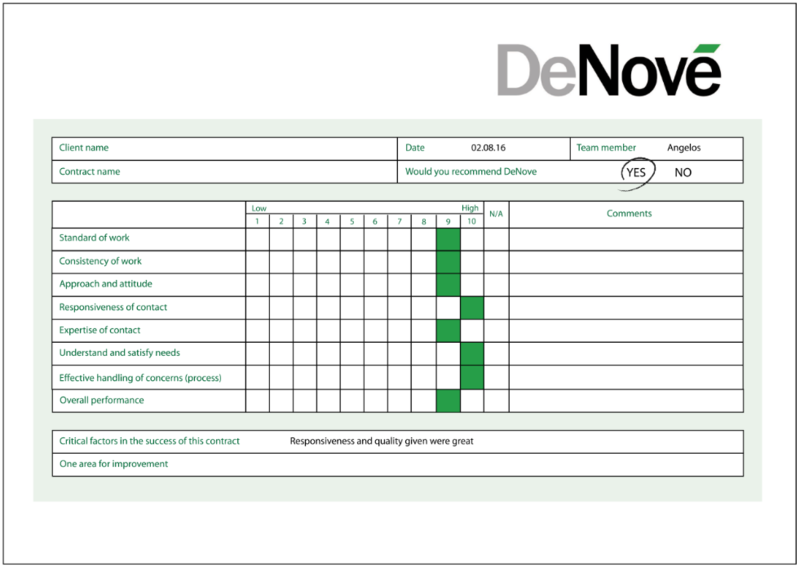 Quality control and performance management are a key process through which DeNové seeks to ensure service quality is maintained. After delivery, the customer management team contact the client. Through either a phone call or email, the Quality Assurance Survey (shown on the right) is filled out. Data is collated monthly and analysed to create an annual aggregated rolling score. Captured data is evaluated in the form of indices and reports. A benefit of this is we can then work collaboratively with our clients to identify and implement measures for improvement and optimization. Client confidentiality and data protection regulations are adhered to, with survey data strictly anonymised. The data from each individual client survey is purely for internal use and is not forwarded to third parties.